djkardkreations: More Scary Schtuff and Eureka! More Scary Schtuff and Eureka! I hope you're doing well! Since I'm posting less often than normal, when I do post, they tend to be Lala Po Loosahs. This one is expecially so, just to warm you. Only a few more days until Halloween, so bless you if you are madly searching for a costume to buy or make for your little munchkin(s). I kinda miss those days. My two little twin gobblin grandsons were here on Saturday and since they won't be here on Halloween, they were allowed to make a serious dent in the bowl waiting for the trick 'r treaters. You know, the one filled with the little candy bars that I hate. Yes, haha, there are actually ones I hate. So, timing being everything, Hammy made me make a couple three more Halloween cards just because I have all this schtuff and it's dumb to put it back in the container for another whole year. The truth is, he's been so patient the last several weeks, I let him make the first two cards all by himself. and decided to just be silly by using my NBUS Memory Box "Group of Ghosts" die to make sock puppets for the spider. When you think about it, that's pretty clever for a hamster. The side borders are Washi tape and the bottom web is just a left-over scrap from my stash. We apologize that one of the ghosts lost an eye in the making of this card. With the negative spider die cut, Hammy made a note card by underlaying the opening with red sparkly paper and cutting BOO from the same paper using a Lil' Inker alphabet die. Shazambam! I used a shimmery white card stock and a NBUS polaroid embossing folder from Darice. The white ghosts are backed with cuts made from black shimmery paper so you can see them. I mean, right? The brad and boo charm are from my stash and the sediment is from SU. Really, for someone who isn't that keen about Halloween, I must say, I have a lot of Halloween schtuff and fixins and such! 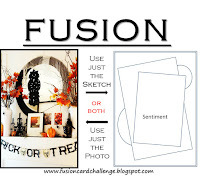 Fusion Card Challenge: Photo only, although I captured part of the sketch. Memory Box: Black and White. TIME OUT Challenges: Photo Inspiration. 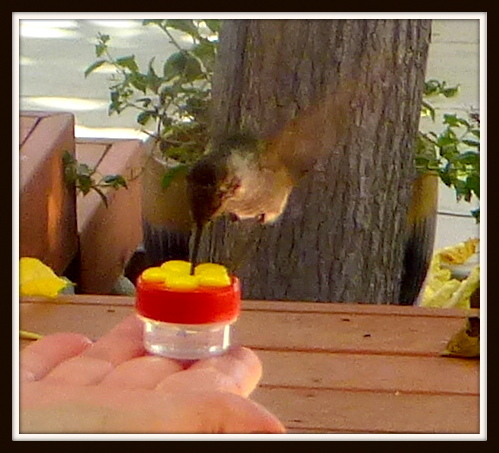 ... that's a hummingbird eating out of my hand! I've been trying off and on over the summer to have this happen and it finally did! What a thrill and then some! And it was right when the Mister was doing his laps on his crutches so he was able to grab a photo through the patio door. It's too bad the hummer is camouflaged by the tree. We will keep working on this and maybe one day I'll have a video for you! The picture on the left is me with Henry and Adam when they were 7 months old and the one on the right is them today at 10 years and 7 months old! I look a lot older, too, but in all fairness, this wasn't planned and I don't have a stitch of makeup on. The photo on the right was the last of 22 photos the Mister took from the bed trying to get one decent picture without one or both of them making goofy faces! It was all that Halloween candy they'd been eating. Or, nah, prolly it's just what all 10-year-old boys do! I'm pickled tink to introduce five more new friends to you! Maike of Maikreations. Maike has only been blogging since January of this year! While she is almost at her one-year anniversary, I consider her to still be a newbie and I'd love to have you make a special effort to visit Maike and welcome her to Blogland! Maike has such a wonderful way of using bright colors in her happy card art! Mimi of She's Crafty. Mime has been blogging since 2011, but she really only took off with it this past August, so I consider Mimi to be almost a newbie, too. Once again, please make a special effort to visit Mimi and welcome her. Mimi has been a life-long crafter whenever practicality called for it, but now her blog has allowed her to get in touch with creating art for art's sake. I think you will see that she is being wildly successful at it! Lydia Evans of Lydia Evans Design. Lydia started blogging in June 2011. She is the mom of two and she enjoys upcycling and recycling whenever possible to craft her art. Once you visit, you won't be surprised to learn that Lydia has won many awards over the years. She also very generously provides us with talented tutorials showing how she works her magic! Andrea W. of Savvy Handmade Cards. 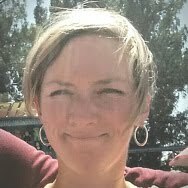 Andrea is from Oklahoma and she has been avidly blogging since 2012. Andrea loves sketch and color challenges and finds creating cards and blogging to be therapeutic as well as fun. She has always been creative and loves painting, beading, sewing, and scrapping, in addition to making her cheery non-fussy cards. Nancy Ball of Nancy's Crafty Blog. Nancy has been blogging since 2009, but she really took off in 2011. She is the mom of three humans and four cats. In addition to making cards, Nancy is a Close To My Heart Consultant, photographer, painter, scrapper, and she loves to cook and sew! I want to be her neighbor, don't you?! Tomorrow is a big day around here as the Mister's hip brace finally comes off! He won't be able to walk without crutches for a while yet, but it will definitely be a big improvement. I'll keep you posted and thank you, again, for all your cards, positive thoughts, and prayers! Really neat cards Darnell especially the spider with the red sparkle paper behind it. Not into Halloween myself and being spring here finding it hard to get into the Fall themes so always looking for other things. Your grandsons look like such a handful bet they keep you on your toes. Great blog friends, found a couple to follow. And very happy to hear the Mister is doing so well. How do you get this ideas; I mean ghostpops; they look great! The combi black and shiny red looks spooky while it is so CAS; that is a clever make! But the 3th is my favo; super design; great the black to set the ghots "free" from the BG..a stunning card! And thanks for joining us again at the TIME OUT challengeblog! Hammy is by far the cleverest hamster I've ever come across, and I think you should let him out to play whenever he's behaved himself enough, as his cards are utterly fabulous! (A spider with ghost sock puppets. Genius!) and I adore your final card too. I find white-on-white so very difficult (probably because my white cardstock has a hint of blue to it... I can never get it to look right! ), and you just made it look so simple. What a fab photo of your with the boys. They've changed a lot, but you haven't. Super photo of the humming bird plus you and the boys. You haven't aged in 10 years kiddo! And wishing with all my might that The Mister gets on well with the brace being removed too! Fabulous Halloween cards. Wow those boys have certainly grown up a lot. Your feeding of the hummingbird is amazing. Morning Darnell, My best wishes for tomorrow when Mister's brace comes off. Moving in the right direction. Jolly good news. Your cards are lovely. I particularly like the spotty spider with socks on. What a clever little hamster he is. Fabulous cards! Of course, since we have red back spiders over here, the red sparkly one really caught my eye! And your hummingbird photo is amazing AND your grand boys look fabulous! Very cheeky, fun photo. Slightly larger than their baby photos!!! What wonderful cards!! I love the missing eye ... it makes all the difference! Yikes what a lovely shot of your humming bird! Good job the Mister was about huh? And your gorgeous boys ... my you don't look a day older! awesome cards Darnell. You always rock! LOVING the cards! LOVE the spiders and ghosts!! And love love love that hummingbird photo and the comparison photo of the boys!!!!!!!!!!!! Great set of cards, but the foto of you and the twins...... super !!!!! Darling cards, super duper kids, great news about the Mister... and I am SO happy that you've finally got that little one eating out of the palm of your hand! Brilliant photos there Darnell! I thought the one ghost was just winking!! That Hummer looks fabulous...the body is fuzzy but the head is perfectly still. Great picture. Hugs to you and the Mister. Oooh, lovin' all those 'spooky' Halloween cards!! And how sweet is that hummingbird pic?! !...Love it! Great pic of you and the boys, too! Hammy should go to the top of the class for his lovely card projects, he's a clever little fella. Love the Halloween selection and gorgeous family pictures. Good news for Hubby and his hip, hope all goes well. Oh those twins are getting so BIG!! Full of mischief, like ahhh...Hammy or is it Mister? Very cute Halloween cards...I'm not much into this particular holiday and my grandchildren aren't either. We generally have a bonfire out back and roast a few marshmallows. That spider die is kinda cute...I can think of several ways to use him on a scrapbook page! I got a good chuckle out of the ghost that lost an eye, I had to go back and look closer. 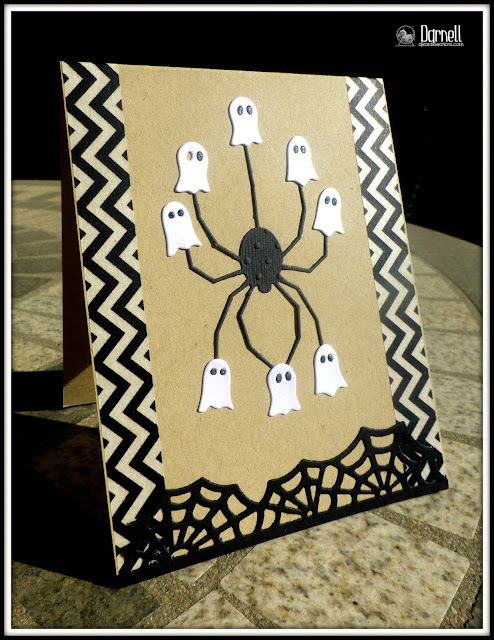 Fun use of all these Halloween dies and really great Polaroid embossing folder! I think I've been enabled on a few new products, visiting your blog today! Concrats to Hammy -- he did an extra-fine job!!! I Love all the cards, but the last one seems to resonate. I love that you recycled all those leftovers! Congrats to the Mister, too! Love that hummingbird! It feels good to visit with my friends again...I have been missing in action. My 94 year old dad took a fall and broke a rib, so between my brothers and me, we have been the nurses. he had a set back and was in the hospital for 3 days, now we just got him into a rehab place...I might have some time to play! I think you have taught that Hammy well, he cards are very cute! *wink. LOVE your hummingbird picture, wow that is really something...they just speed away when I get close!! Cute pictures of your grandsons and YOU! Such treasures!! Have a great day! And The Mister is healing? And doing better? Fabulously spooky selection Darnell, love the 3 ghosts! Stunning photo of the hummingbird and a wonderful pic of you and the twinks! I LURVE all three cards, but that ghost had puppet thing is genius! Also, you are gorgeous, even without make-up, and those boys are too precious! What a cute trio of cards... love the spider socks, but my favorite is the one with the three phantoms. I think I might need a Hammy to help me remind things and be creative. Your grandsons look so much like you, Darnell. What a conquer, having that hummingbird eating from your hand. Good luck for Mister tomorrow! Love all of your cards but especially the one with the three little ghost images :-) Thanks for playing along with us at JUGS! I am loving all of the Halloween cards. Great one using the negative of the spider die. That really is cool as is the little ghosts. Your grandsons are growing up fast too! Hello sweet girl! You look just the same in both pictures..beautiful! 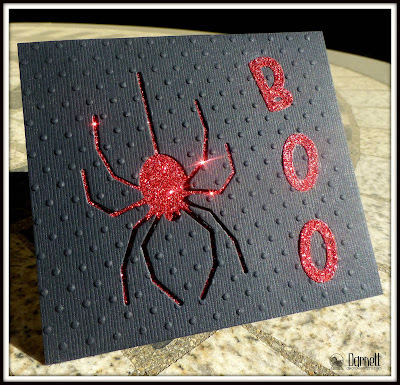 I love your Halloween cards, the ghost on the spider legs is such a fun idea and the red glitter on the other spider is perfection! I almost ordered one of those on Amazon now you have enabled me to go ahead with it. How fun and I can see the bird just fine. I hope that means the mister is on the mend. Oh my...your sock puppetted spider had me laughing...such a clever card and not scary :). The missing eye is awesome, so glad you photographed it like that! Awesome use of the negative die cut too with the red sparkly paper! You ghosts and the boo card...I think this is going to win the MB challenge, for certain! Love! Loved seeing the grands time lapse photo! Oh, this is hilarious Darnell, Hammy is a big helper, I love the Big Scary Spider with those sock puppets, LOL!!. And the negative of that spider looks really freaky in sparkly red!! Now, those ghosts are the cutest, I think I'm going shopping for them, you are a great enabler. PS. Thank you again for all the help with my badges, I think I'm a pro now, LOL!! How many beautiful things, today!! 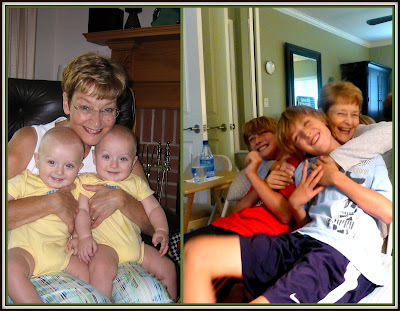 Yor grandsons are so beautiful, sweet and full of life, they keep you young!! The hummingbird that eats from your hands is stunning and wonderful!!! This is a very unusual thing! How lucky are you! Your halloween cards are very pretty and I LOVE the third one, the white on white with the polaroid frame and the three ghosts that pop out so well, it's just amazing!!! Thanks for sharing all these beauties!! What a trio of terrifying trimmings. Alliteration is always a trick or a treat, depending on your bent. You know what a bent is right...it's that thing that's happening to my shoulders. Anyhoo (or boo), you and Hammie have been busy with all the spooky goodies. LOVE that spider with and without the hand puppets. Seriously smitten with the ghost card...what a clean and simple masterpiece. Your current sitsheeation has not dimmed your talent. Floored that you could get a hummingbird to eat out of your hand...are you becoming a bird whisperer? Amazing. Those photos of you and your grandsons are a joy to behold...what a treasure. You all look so happy. I was surprised that you wear makeup, however. Thought that rosy glow was natural. Your cards are awesome but your pics are BEYOND amazing! Not that I don't like your cards....I really do....but it's just that the not-so-wee 'chidrens' and the hummer eating OUT OF YOUR HAND warmed my heart to boiling temps! You know! Love all your ghosties and spooky spider! Third card is my fav with the wee pop of purple and the candy corn colored brad! BTW, you look just as GREAT in the second pic as you do in the first...you foxy lady! Scarily cute cards, Darnell! I'd have struggled to stay still with the amazing hummer that close, LOL. I'd have been too excited. Grin. Gorgeous pix of the boys. Time really does fly! Great Halloween cards, love the last one the most and I am not a fan of Halloween and to be honest have no stash for it at all, I think I have only ever made one card for H. and that was converting a PB stamp of a Hedggy holding a flower and I got a digi pumping and stuck that over the top of the flower. Hoe lucky with the Hummingbird. What a nice post full of cards and photos. Glad you are getting it done all at once as I am leaving town for a few days visiting friends new and old. Honestly you look the same, must be the Midwestern genes. You are so clever to put ghosts on the spiders....um.......feet/legs/feelers???? It's cute and so are the other cards, but the photo of the hummingbird is priceless! What a gem to capture that on film!! That spider looks familiar. I'm not much of a Halloween person either but I am compelled by some strange force to make cards each year. I love the sock puppets that is just too fun. The glittery red spider is a little creepy in the best possible halloween way. 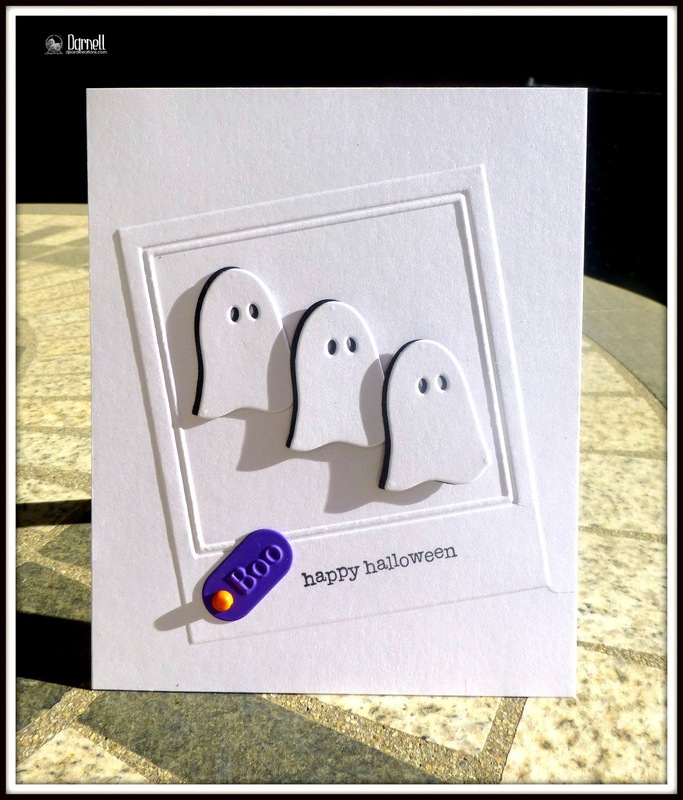 I have to say I am in love with your 3 big ghosts...my favorite of the fab card lot today. 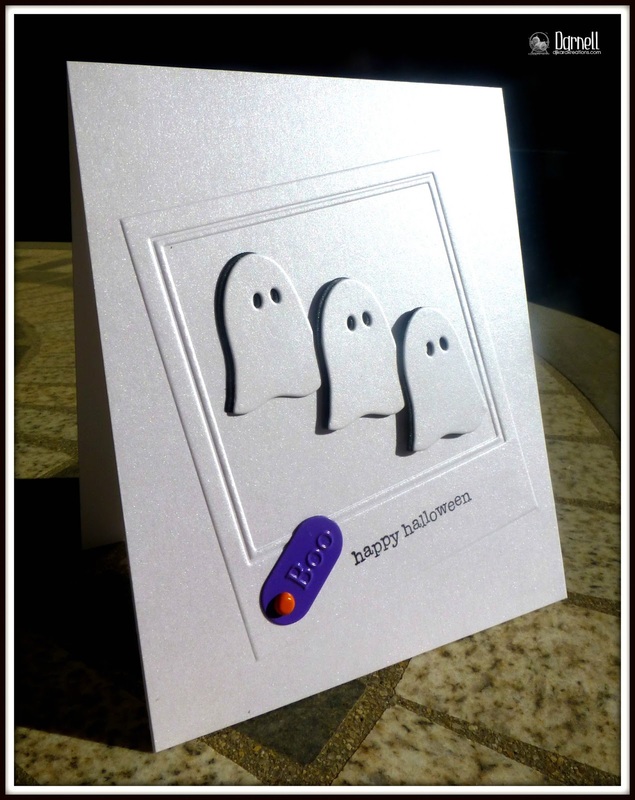 Love your fabulous Halloween cards...so much fun! I have to agree with you about all the excitement of trick or treaters and making costumes for Ashleigh. Wishing a fabulous week and I pray that all goes well with Mister's doctor appointment tomorrow. What a treat to see those fantastic Halloween cards, a hummingbird eating out of the palm of your hand, and your wonderful boys! Those boys love you! Gosh, you and Hammy are an awesome team! The three cards are fantastic and made me smile! Wow! How special that the hummingbird eats out of your hand! Wow--on all four counts Darnell! Amazing that the hummingbird came to you and what an incredible picture. Yay for Kevin to be able to balance with crutches and a camera--well done! Your three Halloween cards are fantastic, I love the spiders (only on cards) and the cutie spooky ghosts! Fun post! Darling cards! Love the spider and ghost one, tho in general, I hate spiders!! I'm really impressed with you feeding the hummingbird by hand. Great picture too. Compliment your Mister for me! Hugs to you both. Cute Halloween cards Darnell! 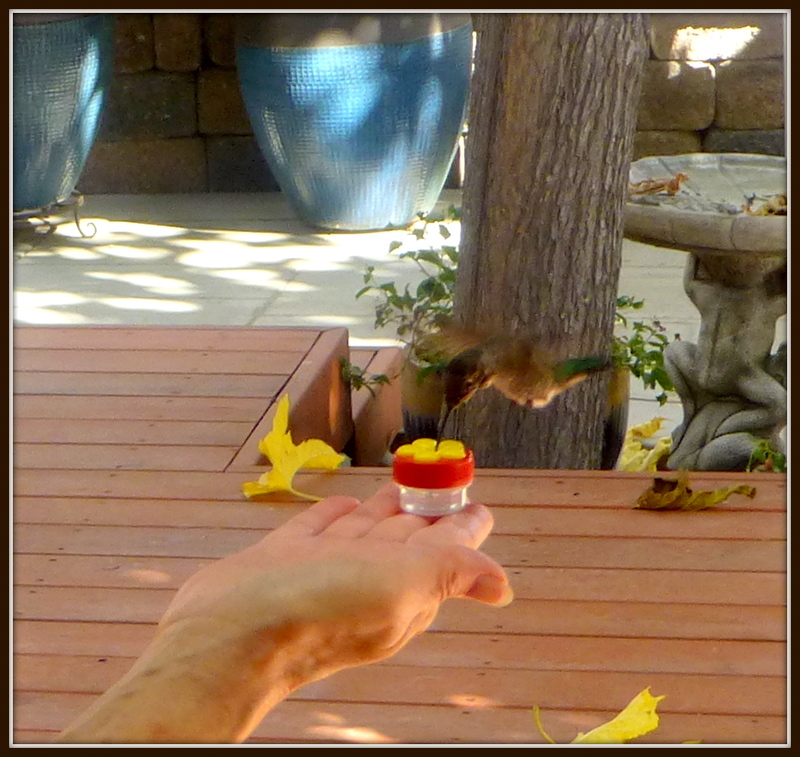 Glad Mister is doing his laps and was able to get the hummingbird in action!! LOVE the photos of you with the twins and you look fabulous in BOTH of them!! My niece is expecting twins In April. Her little boy will only be 18 months old when they arrive ~ YIKES!! Super cute Halloween cards, but the ghostly one is my fave. The shimmery black backing on the ghosts is genius. Did Hammy come up with that idea or did you? Your twin grandsons are awesome! I have twin girls - they're still goofy when the camera's out. I'll be doing the happy dance tomorrow with you & The Mister, Darnell! Good luck with the rehab! Super creative cards, Darnell--love them! Drinking from your hand?! Oh how incredibly wonderful! 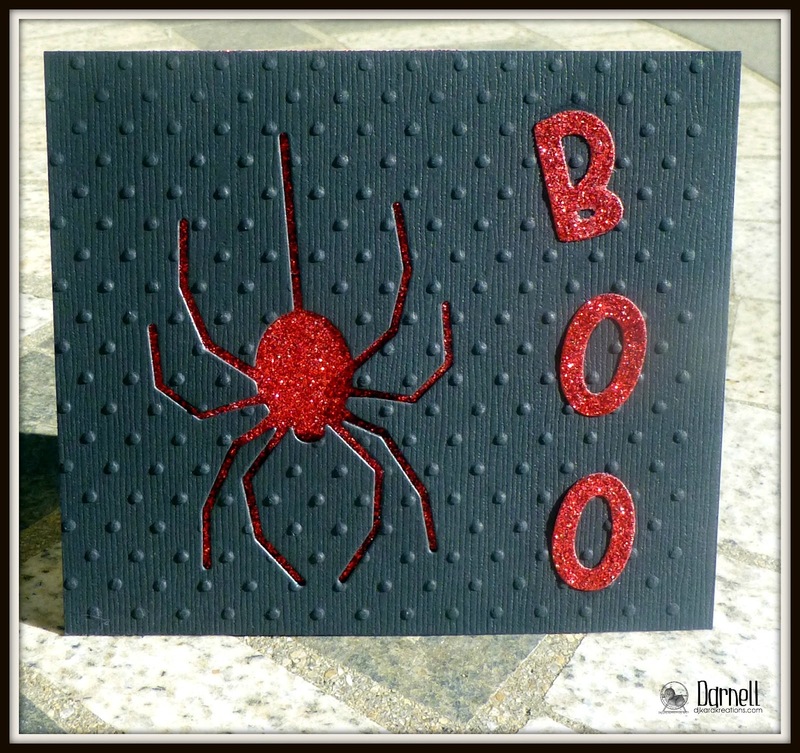 Love that cute spooky spider, Darnell - what a fun card and so is the twofer with the shimmer, too!!! My fave of these is the threefer - such a lovely CAS halloween, beautiful in white!!! Hope you gave Hammy a little Halloween treat for all the work he did. LOVE, LOVE, LOVE the pictures of you and the boys.....both pictures. That Hammy never fails to surprise me with his ingenuity. I thought our dog was smart, but I think Hammy may be smarter! His cards are so cute today. I think he is vying for your attention since you have been with Mister so long so he is bringing out the big guns with his cardmaking. Your card isn't bad either! Kidding - I love the frame you made for the ghosts and the little purple boo. Truly, you don't look like you have aged at all from your first picture. My gosh, the boys are growing up so fast. Cute, cute guys. I'm thinking of you today as Mister gets his brace off. These are all so fun! Impossible to pick a favorite, but the spider sure caught my attention with it's sparkly red color against black background! Love all the cards 'Hammy' made especially the spider that looks like he is wearing ghosty mittens. Thank you so much for the shout out too -you're a star! First of all, I love the hummingbird pic! We have many that come to our cabin and they are very used to us being near them. I should try this next summer! Next, I love your cards! The first one made me laugh! Love the little ghosts on the last one! Cute cards! Thanks for taking the Time Out to play with us! Love your little ghost card Darnell! Your touch of color looks perfect as well! Always enjoy reading your posts too! 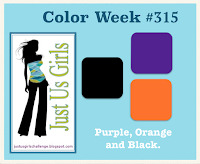 Have a wonderful day and thanks so much for playing along with us over at Just Us Girls! Hammy is quite clever, isn't he? I've never seen ghost sock puppets on a spider before. Don't know why it hasn't been thought of before. Especially in that book about the spider and the pig that was terrific. I would think a terrific pig would have thought of that, wouldn't you? You are so funny! LOVE all three Halloween cards, the spider went from scary to whimsical and the little ghosts are adorable! The hummingbird eating out of your hand is amazing, Darnell~never have seen anything like that. Great time lapse photo of those handsome grandsons, who look ten years older, but you do not, my friend. Your cards are delightful and cute! and the photos with your handsome boys, too:)! Fabulous Halloween cards, Darnell! I like the images for Halloween (cutesy not scary), but as an adult am not as keen on the holiday as I used to be when I was a kid or even a teacher. LOL What fun photos of you with your grandsons. They look like a fun handful. And finally...what an amazing shot of that hummingbird! Your patience and persistence is paying off. Thank you so much for sharing!! So happy for the Mister's progress! I missed this post! I love your Halloween cards. I think of that one ghost with the missing eye as one wearing a monocle. The spider card is cool and the ghosties are fun. I can see the hummingbird and that is sooooo cool to be able to have a picture of this. I laughed right out loud when I saw the finger puppets, Darnell. That Hammy is such a card. But he did make good use of the negative. And you with the leftovers. Those ghosts are fabulous and I love how you used the tag to incorporate the colors. I love to read your posts always improves my mood :-) I fell in love with the 3 ghosts card is so sweet. Poland does not celebrate Halloween, but it's very good fun, right? Thank you for the picture of a hummingbird. What a wonderful surprise! Congratulations to these grandchildren, great The boys. What fun designs ... so very glad you joined us at fusion card challenge. FABulous Halloween cards Darnell - LOVE them all :) So glad you joined in the fun this fortnight @ Fusion! WHAT BOOTIFUL AND SPOOKTACULAR cards you have created here!! Your grandsons are SO LUCKY to have you in their lives!!! WOW - hope you are well and that things are going better for your husband!!! Such cool projects thank you so much for playing along with the Memory Box Challenge. What a great peek into your day! I miss shopping for Halloween costumes too although.. gosh .. what a hassle at the time! Just goes to show you need to appreciate the moment you are in! I LOVED the pics of Henry and Adam with you... then and now you can see how much they enjoy being with you - the smile shows even in their eyes! Lots of love here... And the hummingbird? How cool is that? Give Hammie a kiss! I think his cards are AMAZING! I need that spider now! SO clever to have a little skull on each leg! Life is good Darnell! I hope the Mr. is doing well! What great cards you made! You did such amazing things with Memory Box dies. I am especially impressed with your white ghosts on white. I struggle so much with white on white, and you did it perfectly. Thank you so much for participating in our October Memory Box challenge! The photos of you and the twins are simply fantastic! The love they have for you, and you for them, shows in their smiles! Handsome lads and a gorgeous grandma...happy sigh! As for making faces: Mr. C is all about that when it comes to picture taking. Must be a boy thing...The hummingbird: a marvel of nature! Yet another sign of how your gentle spirit speaks to all creatures. As for Hammy...he totally rocked his Halloween cards! A spider with mittens, brilliant (perhaps their little hands do get cold...); a glimmery red spider, striking, Speaking of spiders, one of cycling gals we know, who owns a bike shop in a town just outside Edmonton, discovered a black widow spider in a bike box. The story made it to national news here...Anyway: your picked-up-the-pieces ghost card: spook-ilicious! Wonderful Halloween cards, Darnell and I love the pictures. What fun it must be to have twin grandsons. Great smiles on all of you.